I am pretty sure we have switched from Brooks to Nike for the team uniforms. I just need to get everybodys sizes so I can send the order up the chain and we can get the new gear in time for the upcoming racing season. I know there are two scheduled runs this weekend. However, since there is vast array of running talent here and as usual there are different strokes for different folks, there is no need for anyone to be excluded from group run love. Bottom line, if others want to meet on Sat at the G-town store for one reason or another, please let your voices be heard now via the blog. This way someone will be there to open the store and get the run started. Guiliani's loss in Florida sunk his viability, and so Klim's prudence saved him from wearing a dress... but don't fear... there will be time to slosh him up enough to provoke his rashness. For any of you that might be interested, Klim and I are running a tempo run with Pacers' Steve Crane on Saturday morning (2/2) at 9:30. The venue is Buddy Attick Lake in Greenbelt, MD--right off of the Beltway. The lake has a 2k (2,040 meters, actually), soft-surface loop that's similar to the towpath but with some small notable hills thrown into the mix. I think the plan is to run at least 4 laps, though some may go as far as 7 laps. 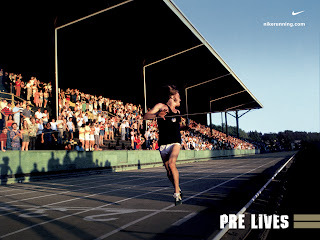 Everything will be marked: the 400m, 1k, and mile for those who like to keep splits. This is the same place where I used to run my tempo runs and XC workouts in college. We'll meet in the adjacent parking lot to warm-up. So, I scanned Robert Cannon's training log for insight- I've mentioned him before, but just to give background- he ran as the second youngest guy to make the trials... his qualifier and actual race were both around 2:20... I know it can sometimes be hard to get a sense of the big picture when looking at individual workouts... so, if it helps- Trials were early november..
in July he ran about 100 mile weeks. His workouts were largley 4-6 mile tempos ending with 400-800 repeats. "20min warmup (sunny, low 70s)2 X 30min 2min jog in between to get back to the start 15min cool down ice bath ran a 1mile rolling loop across from the high school - i measured it to be a about 10meters longer than a mile with rolling hills for a simulation of the trials course - wanted about 5:40/milecame through each mile a second or two fast - hit the first 5miles in 28:06 and the second in 28:12 - felt really bad the first few miles (most likely from going from 8min/mile right into the workout and the fact that I haven't really recovered from Sunday), but got into a descent rhythym after - need to keep working on the engine"
"2+mile warmup (low 70s, sunny)2 X 45min w/2min jog on the same course that I ran the 1hr run last week onsplits:5:43; 5:56; 5:52; 5:49; 5:52 (29:13 for 1st loop)5:39; 5:55; 5:55; 5:53; 6:01 (29:27 for 2nd loop)5:46; 5:56; 5:59; 6:06; 6:05 (29:55 for 3rd loop)1:26the 45min break was just alittle over a minute before the 8mile mark2+mile cooldownvery hard workout - I could tell by the first loop that this wasn't going to be easy - legs just couldn't find a rhythym - by the third loop, I could barely get up the hills - legs were dead - just too hilly of a course - really solid effort throughout, breathing felt good, but really felt how hard it is to run a long time on the hills - legs, arms, and abs really sore by the end - didnt take any liquids which I really should have"
"3mile warmup + strides (slight wind, 70s, 90+% humidity)10mile MP run = 53:25 (ave. = 5:20.5)(ran a 2.5 mile stretch that rolls the whole way)(splits: 5:13; 5:13; 5:21; 5:18; 5:23; 5:25; 5:25; 5:20; 5:22; 5:21)4mile cooldownreally tough marathon paced run - i dont really sweat that much but today was a different story, soaked by mile two - the turning, hills, and humidity really got to me early plus the fact that I went out a bit too quick - paid for it in the middle and seriously thought about bagging it - glad I didnt because I was able to find a descent groove at the end - Dad helped with giving me Gatorade"
Tempo runs are very crucial to training. Hall, Gildea, and thousands of others swear by them. So maybe this will get a conversation going. Here are a few of my questions for everyone individually: How far? What surface? What time and what day of the week do you run your tempos? I have been running mine solo on the roads, but I really want to get on softer surfaces. I'm currently doing 6-8 mile tempo runs on a road loop in Montgomery Village once a week. I'm trying to build up the length every few weeks. I know Laura had posted about gettting some people out on Thursdays from the store. I'm interested in checking that out, but is anybody interested in running some tempos on the Canal in the coming months? I spoke with Jake and Bain about a run on the Seneca Creek Trail this weekend. We are going to do it. 2hrs or 20 miles, give or take some inches or minutes. Also, for those who just want to come and run in a nice place and do something at their own pace, please feel free to come along and do you your thing. After the run we can go to Starbucks in Potomac for coffee, food, etc. Murphy can also do his weekly bulk grocery shopping at the Discount Giant. What day are people able to do it, Sat or Sun? Most people per day wins out. Please let us know via the blog by COB Wednesday. Also, the race with Pacers is set. I have told them that some of you all are in terrific shape and the score will be on par of that between the Redskins and the Patriots, this past season. With us, being the Patriots, of course. We do need one more woman, however, if we are to compete as a Co-Ed team. Laura, Dawn, Megan, Kelly, whats up? Hey guys, just a heads up, there is a good group running quality track workouts at W&L High School in Arlington every Wednesday at 6:30 ( warm up at 6:00 I think). Most are pacers guys. I don't know about you but I can only do so much by myself and need a little push sometimes. I was at the track for the first time in about 9 months running a workout with Mammen when I saw the group and they invited us to join in anytime. We were already three sets deep so I didn't do the workout with them last night but they were running 8's anywhere between 2:15 to 2:30. Also, I'm running an indoor mile race (just for Sh*ts and giggles) at the PG complex this weekend if anyone is interested. Billy, $$$$$$$, Murphy, Peter, Timm, Zach, Reaves, Mighty Matias, Christiam, Bain, Herzog, Carr, Dwyer, Ernst, Munro, others?????? This is the ultimate "CITIZEN RUNNERS" race. No frills and all hills in Columbia, MD. Tough and cold. Good workout for Boston. Even with Klim off the block doing that half way out by William and Mary, we should be able to field a team strong enough to win. 20 minute drive and by 9ish the race is over. Coffee and bages after. Yesterday, I met Pat Murphy and Zach Britton down at the Capital Crescent trail in G-town to run a 20K sponsored by the DC ROAD RUNNERS. Among the famous and not so rich, was Bob Marino, another one of the "old guys" who, back in the day, would battle Moeser and Hage for local bragging rights as the area's best runner. Typical of his era, he showed up at the race looking even more un-cool than me. Sweats, 70s style headband, a sweatshirt stamped with the label US NAVY on it. Totally old-school and awesome. Anyway, Ted Poulos was there as were many other faces that looked familiar. The race is so low key, that nobody knew, including the race director, where the start line was. Eventually he found it and boom, the race started. Right from the get go, some kid from the US Navy, bolted out like a piston. He had a huge lead. Well, myself, Britton, Murphy, Marino and some other dude, settled into a pack and slowly reeled him in. As we ran we hit several big patches of snow and ice. These slowed us down quite a bit as we had to really dodge and dart away from the ice. At the 6.2 turnaround, Murphy who had a slight lead on me, said way to go Max, or something similar, and as he said this and I began to make my turn around the cone, I wiped out and slid to the ground. I felt like a marine doing some sort of combat routine. Anyway, I bolted up, shook off the stinging sensation that resonated down my elbo and decided to not let those guys run away. 1 mile passed and we started to get strung out. Murphy and Britton really started to race and pick up the pace. They caught the lead guy and moved ahead. Being the old man that I am, I held back and back and slowly reeled in the #s 3 and 4 guys until it was just Murphy and Britton in front of me. At some point Britton made a move and Murphy decided not to go with him. I caught up to Murphy and in his always pleasant demeanor, he simply said, I have had it or something similar. With 3.5 miles to go, I decided to put a little more speed on and see if Britton would fade. Just when I thought I would get him, at mile 2, he put a surge on. I did too, but not enough to reel him in and he ended up running a strong finish to get the victory. In all, it was a good, hard run with some tactics and adventure thrown into the mix. My end time was 1:12.57. If I had not fallen and there had not been snow and ice, I say my time, as everybody else's, would have been 1 minute faster. As for today, Klim, Dylan, Christiam, Bain, Tanner, Murphy and Reaves and myself ran a solid 18 miles in the frigid cold out by Old Angler's Inn. It took my about 9 miles just to warm up and get the legs to feel alive. We did a solid pace with a little speed thrown in at the end. After, we went to starbucks and talked smack. Klim, is now claiming that if Giuliani loses he does not have to wear a dress at a race. I forget the specifics of the bet he made with Dwyer a few weeks back, but I could have sworn, Klim, wearing a dress, was part of the deal. After two pretty high mileage/intensity days, my legs are tired. Time to rest a bit. FYI---Please look at the most recent Running Times. In the section where Master Runners are ranked, Moeser is the #2 guy in the world(i think). for his age group, 55-59. I am learning(always) about the body and how it responds to treatments for injuries, what to apply for what type of injury, etc. I am not sure what any of you all do. I could describe the stories I hear from dozens of runners in the area but that requires too much writing. Below are two examples of injuries that I have been working with for approximatley two years. 1) Hallux Limitus(stiff big toe). I went to the Podiatrist recently for a toe problem. He examined my big toe and said there is a large bone spur on the joint that connects the toe with the rest of the foot. This is due to the massive amount of flexing this toe has done over the years. Anyway, to make a long story short, the toe has not been able to bend upwards for 2 years. It is stiff but really does not cause pain, just some aggrevation. 1)In older people and in severe cases, doctors will operate to shave off the spur. However, it usually grows back and is worse. Hamstring Strain. I have run with a strain in my right hammy for 2 years. I can run through it but the hamstring is forever tender. I have tried little bits and pieces of all three and still suffer a bit. Wilson Komen suffers through the same injury and has had it for 8 months. I know Jake has had some shin problems but I have no idea if others have or do suffer and just run through these things, etc. Please e-mail your personal info for GW 10k and Club ten mile challenge. I am taking Munro and Moeser off the 10k list as I do not think they are racing. If anyone else wants to do it, let me know. We need a woman on the team, too. Melissa or Laura wanna do it? I was thinking of running one of the local MCRRC race series races on Saturday. It's 5 (semi-hilly) miles and my goal is to run a good warm-up then run 5:20 pace for the first 4 miles and then see how I feel. I am trying to mimic my half marathon pace (hopefully!). Then I'll run a longer cool-down...maybe right after finishing. Anyone else interested? More info below. I am meeting Patrick Reaves at the Old Angler's Inn parking lot on Sunday at 0930 for a long run. He is running 18...I will try and run the same. We'll hit up some of the hilly trails above Great Falls on the MD side before or after our melancholy route along the C&O Canal. Any takers? Though the course will be much the same, we have a new start and end point for 2008—about a block over from the (now closed) school we previously used. Named in memory of club member, Jim Starr, this 5 mile (Championship Series) race is part of our low-key club race series. As such, it is free to MCRRC members and only $5 for non-members. Registration is race-day only. I-495 to New Hampshire Avenue (Rt. 650N); turn left onto Cresthaven Dr, follow to school lot. The West Hillandale Swim Club is going to allow us to park in their parking lot. They are directly behind Cresthaven Elementaty School (and across the street from our old location, on Schindler Dr.) If Cresthaven is full, simply park in the swim club lot, walk up the hill to the right of the pool building. In about 50 feet you will be on Cresthaven property, in the field behind the school. The address for the West Hillandale Swim Club is at 915 Schindler Drive, Silver Spring, MD 20903. Their web page is at http://www.westhillandalepool.org/. Sunday, February 24: RRCA Club 10 Mile Challenge is set to kick off after last year's event was canceled due to inclement weather. For anyone who is looking to run a 10 mile race (for $0), feel free to register following the enclosed link. I wasn't sure if GRC had its own recognized RRCA club, so if you do and want to compete as GRC, I would suggest getting in touch with the race director. However, you are more than welcome to run as an honorary member of Falls Road, and if GRC has enough runners, we can separate and hold our own team competition. It's a good race, always competitive and all local folks. It's rolling, so it won't be a PR course, but a good 10 miler to do prior to Cherry Blossom. Developers are pushing an above ground light rail... I think because it is cheaper. Also, we're not exclusively marathoners- before boston we're racing a 5k, 10k, 8k, and jake's doing a 10 miler... so we need some speed.. so three miles just under 10k pace 4:55-4:45 and the 800s were for the shorter races we have coming up. And yes, we will be doing tempo runs in late feb/early march. Last year this involved 12 miles at 5:40s then dropping into 5:30s. I predict one of the women from the DC/Metro area will run 2:35 at the trials. Since all of the runners are awesome runners and good looking, too boot, its impossible to know which ones or which one will prevail as the region's top dog. With this in mind, I wish them all luck. I am sure there are others but these are the one's I know of. As for our own group running Boston, I am not sure who will come out on top. Reaves is running big miles and is strong as a beast now, so he is my early favorite. Klim or Dwyer might come on. Who knows. What's the running routes for this weekend. I need 20 on Sun and something solid on Sat(10-11 miles). one run on trails with rolling hills, would be nice. Seneca Creek Greenway Trail 16.5 miles - moderate This natural surface trail follows the Great Seneca Creek from the Potomac River upstream to Route 355. The trail continues on Maryland National Capital Park and Planning Commission park land. 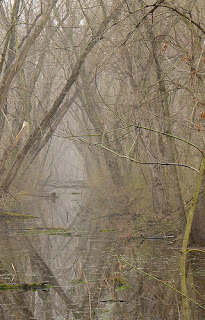 The Greenway provides access to the Great Seneca Creek stream valley for those who enjoy the challenge of a long hike in the beauty of the outdoors. Due to the environmental sensitivity of the trail's location, bicycles and motorized vehicles are not permitted on the state park section of the trail. Section 1: C&O Canal to River Road and Seneca Road (0.9 mile)This area of the Greenway Trail reveals traces of the past as you see red sandstone remains of a large stone-cutting and polishing mill. 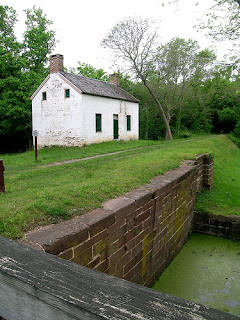 Further up the canal is a stone quarry and Seneca Red Sandstone cliffs, which were used as early as 1774. I would like to do this one on Sun. Are others game? In an effort to represent the ladies on this board, I thought I'd mention that Lisa Thomas qualified for the Olympic Trials in the marathon with a 2:46:13 this past weekend at the P.F. Chang's Rock and Roll Marathon in Phoenix! Congrats Lisa! The almost 10 mile loop is only on busy and well-lit roads (for safety purposes). Be careful at a few of the busy intersections (especially Nebraska and Connecticut, as drivers seem to lose all common sense there). Starting and finishing at my apartment (~Van Ness and Connecticut) mimics the down-up-down topography of Boston a little better than running from the store, but you still get in some of those long grinding hills. I always ran it clockwise, but you might want to try counter clockwise. There's my 2 cents. Hope to see some of you on Thursdays! This past weekend's training was very good. 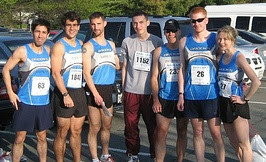 We had large turnouts of quality and serious runners on Sat and Sun. The sat Progression run turned out to be a race(my fault) as we went out too fast the last 5 miles and by mile 8 were gassed. Other than that, Wilson and Raabe were there as was Matt Ernst, Chuck, Chris Bain, Herzog, $$$$$$$, Billy, Pat M and Susannah K.
The Sun run was awesome. Jason, Billy, Pat, Chuck, Reaves and Chris B turned out for 16-18 miles of muddy trail running through some nice country. We explored and conquered. After, we went and had brunch at the Silver Diner in Reston. Also, on Sunday, there was a cameo appearance made by Alan Webb and his training group. I hear that the trails out that way are one of his primary training grounds. I have been running with various groups in this area for 6 years. This is the best one so far. Its creative, flexible, filled with good runners, and too boot, people are laid back and there does not seem to be any ego maniacs. I'm working at the store till 6, and will then head over shortly thereafter as it may get packed. come one, come all- let me know who to expect in case I need to hold a table. Reminder that tomorrow is a progression run from the G-town store at 8:30am. Plain and simple. Start out slow and end fast. Do your thing(own pace).Wilson is coming out to run slow and I think Raabe said he might parachute in from a black helicopter. A bunch of other hungry souls are venturing out, as well. Sunday run is beteen 15-20 miles on rolling trails around Great Falls. Some will run 15 or 16 and some 20. We will meet at the difficult run parking lot and leave 9amish(be there by 9). pancakes after. bring GU or Cliff Bars and water. Elite Masters Marathoner John Piggot. This guy can crank out a 2:37 marathon once a month if he chooses. He runs 60 miles a week with one speed workout and one long run. Michael Wardian, A MAN POSSESSED: He runs between 17-20 miles a day and races every weekend. Deena Kastor, I have been told by semi reliable sources, runs 140 miles a week and almost every run is hard. She sleeps 14 hrs a day and gets massages with the rest of her time. Wilson Komen, (I trained with him for a bit). 120 weekly miles with two hard runs per week and one long run. Very simple. 2:17 marathoner. This schedule applies to Chris Raabe as well. He too, is a 2:17 marathoner. Brian Sell and Nate Jenkins, two of the USA's toughest marathoners run mega miles(150 or more miles per week). More than 4 runs per week at very hard pace. These guys rely on toughness and durability to make up for their lack of natural speed. There are millions of others but this should get the ball rolling for discussion, comment, etc. This is good. I have been reading people's training logs. Pretty intense stuff. When I was 24 or 25 or whatever, I was doing other things in life(hedonistic). The type of running and pain endurance episodes some of you are doing/going through takes total committment. I am not sure if this is good or just plain addictive compulsive behavior that will make some of you obsolete to the rest of humanity. In any case, its an interesting ride to be on for a bit. I am only running 55 miles a week but mix it up with weights, kayaking yoga and dating beautiful women(another totally different type of game). December 31, 2006. Around 8 PM. -Fiddy2 was done. I realized I had a whole year ahead of me of uncertainty. I was exited for the changes but did not know what the future held. - I had just accepted a job offer and hammered down the details. In one month I will be moving to Salt Lake City to begin a new career and a new life. I am excited for the changes and see no limit to my future. That’s right. After over 3.5 years of living within a stone’s throw of our Nation’s Capitol, I will be packing my bags at the end of January and moving to The Beehive State. I have accepted a position with Ragnar Events to be a…well…I Am not quite sure what my title is. I will be working as a race director. I will be giving motivational speeches. I will be traveling to race expos. I will continue my work that I have been doing for the past few weeks wherein I will be mapping potential race course for the future. 4,500 feet up in the air I will live rather than 45 feet I am at now (depending on the hill I am living on). I have all the anxieties and pins and needles that come with leaving wonderful friends behind but know that that will remain close to me in my heart no matter where I travel. Thus begins 2008 for me. A year of great opportunity. Come join me, won’t you? Thanks all of you guys for the hard work the last few days. Two hard/semi difficult days in a row of solid miles counts for something. I do not think for any of the two runs, except for some little warmup stuff, we ever dipped below 6:40 over what amounts to 28 miles of running. This is with hills and tough terrain in the mix. This is what it takes. Thanks to Pat and Jake, today, I ran longer than I have since the Marine Corps Marathon. My assignment to Jake and Pat and anyone who really wants to get faster for the marathon, is to make an effort to get with Raabe or Komen for a workout or two and just get humbled. Feel the pain for 5 miles or more and learn to enjoy it. Now for a recovery day and lots of protien and nourishment to help heal the muscles that have been trashed. Pat M. or anyone else, I am running at 6:30am from Pierce Mill on Tuesday and from the store at 4:00pm on Wed. I hope to catch Raabe and see whats giving. We are going to start having runs from the new Store in Chevy Chase (4461 Willard Ave 20815) on Tuesdays and Thursdays starting this coming Tuesday. This should be a lot easier than Georgetown for the people that live in the Bethesda, Rockville, Silver Spring area. The runs are going to begin at 7 pm because that is when the store closes and I will be the only person around to lead the runs. The route for the run is still up in the air. I am up for suggestions since I have just been running up and down the major ave's when I run at night. And if anybody has any night running gear, like reflective vests or head lights, I would reccommend bringing those along for the run. Thank you for your continued support. There are a lot of guys out there (me included) who recently graduated from college who would like to continue to run and race for a post-collegiate team. Most of us aren't all stars, rather, citizen runners with full time jobs who enjoy one another's company while training. We’re all part of the 40 hour work week and the DC rat race, but all of us ultimately want to get faster and faster…and faster. Below is proof that this training group is working. These are the top times for each person in each distance they raced this year. It is remarkable how many people have PR’d in each distance over the past 12 months and I would argue that the support we give one another is a huge factor in obtaining these personal bests. GRC even has a token Ironman in Matias and token UltraMan in Dane! Having others to run with is key and I believe if we keep it up we’ll only get faster and faster. I’m hoping to have an army of runners to train with on weekend runs as we push through winter and on into spring. Who is with me? Happy Running in 2008! 4:12.7 – Joe Wiegner - Penn Relays OD Mile Run, PA - April PR! 4:32 – Luke Merkel - DCRR Track Championships 7/25 PR! 4:36 – Christiam Camacho - DCRR Track Championships 7/25 PR! 15:06 – Joe Wiegner - Shamrock 5k, Baltimore – March PR! 15:17 - Jason Dwyer- Haverford Indoors - 1/27 PR! 15:21 – Jake Klim - Shamrock 5k, Baltimore – March PR! 15:55 – Patrick Reaves - Blizzard Blast 5k, Tampa, FL - 12/29 PR! 16:52 – Christiam Camacho- Fairfield 5k, Fairfield, CT PR! 25:12 – Jake Klim - Rothman Institute 8k, Philly - 11/18 PR! 26:37 - Patrick Reaves - Rockville Twilight 8k PR! 30:06 - Matt Herzog - Celtic Solstice Five Mile PR! 30:09 – Dane Rauschenberg - Rockville Twilight 8k PR! 31:58 – Matt Ernst - St Patrick’s Day 8K - WDC – March PR! 30:33 - Allen Carr - Veterans Day 11/11 PR! 31:29 – Jake Klim - Pikes Peek – Rockville - April PR! 32:38 - Matias Palavecino - Pike's Peek, Rockville – July PR! 35:04 – Christiam Camacho - Pikes Peek, Rockville – April PR! 38:16 - Matt Herzog - Jingle All the Way - December PR! 39:03 – Matt Ernst - Pikes Peek – Rockville - April PR! 52:53 – Jake Klim - Cherry Blossom 10 Miler - 4/1 PR! 56:47 - Patrick Reaves - Annapolis 10 Miler - 8/26 PR! 57:54 – Christiam Camacho - Cherry Blossom 10 miler - 4/1 PR! 1:11:47 – Dave O’Hara - Colonial Half Marathon - March PR! 1:12:29 - Matias Palavecino - Austin Half Marathon PR! 1:13:04 – Patrick Reaves - Parks Half Marathon - 9/16 PR! 1:24:55 – Matt Ernst – Philadelphia Distance Run – 9/16 PR! 2:37:04 - Matias Palavecino - National Marathon 3/24 PR! 2:39:41 - Dave O’Hara - National Marathon 3/24 PR! 2:42:27 - Patrick Reaves - ING Georgia Marathon - 3/25 PR! 2:42:37 - Jake Klim - Grandmas Marathon, Duluth, MN - June PR! 2:48:13 – Luke Merkel - National Marathon 3/24 PR! 2:55:34 - Dane Rauschenberg – Steamtown, PA - September PR! 3:08:45 – Matt Ernst – Philadelphia Marathon – September PR! 9:49:06 - Matias Palavecino – Hawaii – October PR!